OK, our post for today was so long that it was freaking out Typepad, so we decided to break it here. So read the previous post and its comments to get today's full picture. For some reason, our dates were all screwed up. At the same time I was trying to fix that, we were being interviewed by the Pasadena Weekly and the wife called. Lucky we studied juggling! This is as of 10:30 tonight (Typepad's day starts at 0:00 GMT, which we think is 5 PM Altadena time). 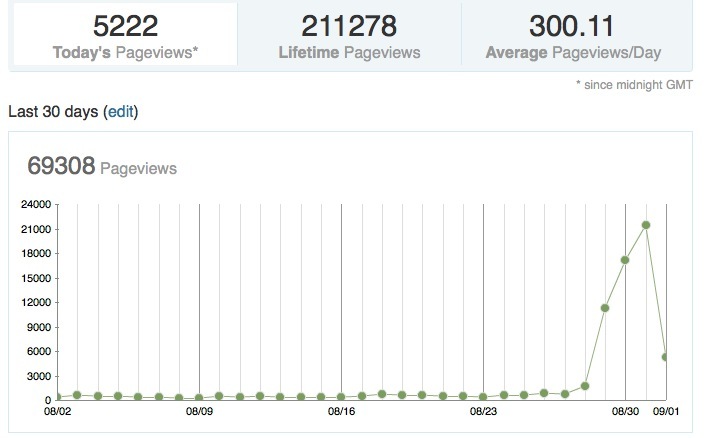 The peak is Monday's (today's) stats, which is 21,426 page views. Even five hours worth of tomorrow's stats is about ten times what our old daily average was. We are overwhelmed, and we thank you, the community of those who live in and love Altadena, for your support over these past few days. 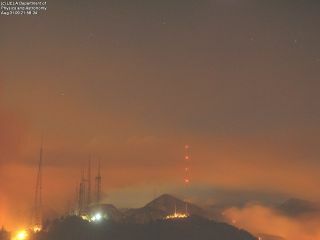 Monday, 31 Aug 09, 5:30 pm PDT - As I mentioned earlier, we have lost the new backup power to the mountain. In anticipation of a possible loss of all power to the Observatory, where the MWO webserver is located, this update site will be relocated to http://joy.chara.gsu.edu/CHARA/fire.php. I will continue posting material on the current server, but if and when it goes dark, please make a note now to try the other URL if you are interested in keeping in touch with this situation from our perspective. In this event, the Towercam will also go dark. In the meantime, please keep coming to this site. We just checked the URL -- the present URL works, the new one says "page not found," but we can assume it will be activated if Mt. Wilson's server goes kerflooey. Today's Whisky Tango Foxtrot moment: Somebody called (that's how it usually starts). They wanted an ad. Not interested in a display ad. They wanted a classified ad. For a rental property. Is there anything resembling a classified ad here, or has our mind finally gone? Back again: Thanks for your indulgence. Had a wonderful visit with Dr. Mrs. Altadenablog, who is healing quite nicely. We saw the middle of the Sound of Music, up until the Nazi flag shows up. Our family does Sound of Music like some people do Rocky Horror. Drove the length of Loma Alta on the way home, and it's grand to see -- no roadblocks, no blinking lights, just some firemen from Ventura County shaking hands, packing up, and driving away. Thank you, guys!!! Also just called the sheriff's station: as of 9:45 this evening, the only area under mandatory evacuation is Chaney Trail, and there is a deputy there keeping people out. And, checking the comments, you people rock in terms of getting information pinned down accurately and getting it out there! Thank you! This blog now practically runs itself! Life goes on: scanner says they're looking for an armed robber about Glen Rose and Altadena Dr.
Just got off the phone from the Supervisor. The houses North of Loma Alta from Fair Oaks East to Lake Ave are still under a mandatory evacuation. The mandatory evacuation for houses north of Loma Alta from Fair Oaks West to the Arroyo has been lifted. School's still out: Parents of Odyssey Charter School students received an email that the start of school has been delayed to Sept. 8. Monday, 31 Aug 09, 2:46 pm PDT - CHARA Array operator PJ Goldfinger reported that at about 2:00 pm she monitored an LA County Sheriffs Department transmission advising a pullout from Red Box, the major staging area near the mountain. I just spoke with Sherry Roman, Public Affairs Officer of the Angeles National Forest. She could give no updates as to the status of the fire in the Mount Wilson vicinity except that the USFS still considers that passage of fire across Mount Wilson is imminent and will be fought aerially rather than with ground personnel. Once the fire is through the area, they can assess the damage by air after the event before they can send in ground personnel. She also confirmed what PJ's monitoring implied, that firefighters have been removed from Red Box. OK, we are on our way to making our daily hospital visit at 4 PM. Comments are open, and we will be back in the saddle sometime late this evening. Godspeed, and be safe! And seeing if the weather stations are updating. I read that one of the 2 powerlines is down. Also some reports of flare-ups in the Meadows, so the sheriffs are not letting people in again.